In fact, a TV's refresh rate has nothing whatsoever to do with the signal flowing to that set. The refresh rate is determined by the set's circuitry once the signal gets there, so how can different HDMI cables be manufactured for different refresh-rate sets? Clearly the intent of the refresh-rate labeling is simply to confuse you into spending more money on HDMI cables than you need to. TV retailers, including Best Buy, use this new misleading labeling to push naïve customers into buying unnecessary, overpriced cables that can cost far more than necessary. Adding such labels — the latest being "3-D" — helps sales clerks persuade customers to overspend. The extra dollars spent will have no effect on image quality but they will lighten your wallet. To view Blu-ray, Full HD 3-D content and any other source at the highest (1080p) resolution, you need HDMI cables. It is a single-wire solution that conducts a standard definition or high definition 2-D or 3-D video image and accompanying audio tracks from a source device to an HDTV. Only two types of HDMI cables are included in the HDMI licensing spec: "Standard" (aka category 1) or "High Speed" (aka category 2). The latter is required to assure the cable passes 1080p signals (including 3-D), which is the highest bandwidth video signal available now and for the foreseeable future. HDMI cable makers mislead consumers by mislabeling their step-up quality HDMI cables with the various refresh rates used by set makers to improve picture quality. Despite the fact that some labels indicate signals of 480Hz, the signal fed by an HDMI cable to a set never exceeds 60Hz. HDMI Licensing LLC licenses the design, specifications and requires labeling of cables as either "Standard" or "High Speed." 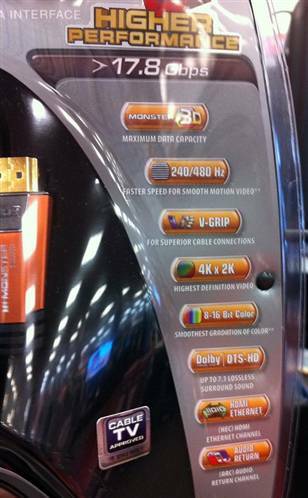 HDMI does not have any rules concerning additional labels, according to its spokesman. While the HDMI standard has been updated to include new optional functionality such as passing Ethernet network signal, there remains only two speed categories. Any "High Speed" HDMI cable should handle any display and any video signal you can throw at it. HDGuru visited a number of local TV dealers. Best Buy had the widest selection, offering "High Speed" HDMI cables from Monster, AudioQuest, Rocketfish (BB house brand) and Dynex (BB house brand). They all display labels that tout their own capabilities. The least expensive is a Dynex 4-foot "High Speed" cable and costs $29.99. The box says 1080p 60Hz. The first step-up is the 4-foot Rocketfish at $49.99, and the package reads 120Hz. Next is a 4-foot $69.99 Monster 700 model cable, with a label stating 60/120Hz, followed by a model 900, labeled for 120Hz and 3-D, for $79.99. The Monster 1000 model boasts a 240Hz-480Hz and 3-D for $129.99 for 8 feet. AudioQuest has a line of "High Speed" HDMI cables; its packaging states that it "delivers 100 percent of the data required for 120Hz, 240Hz, 600Hz displays." It costs up to a whopping $229.99 for its 6-1/2-foot Carbon model (sold online from Bestbuy.com). The BB website states "High speed 1080p/120Hz/4K" — there are no 4K consumer video signals. By comparison you can purchase a 6-1/2-foot "High Speed" HDMI cable from Amazonfor as little as $3.99. It is a "High Speed" rated cable that will pass any HD signal (including 3-D) to any HDTV. Keep in mind a signal carried over an HDMI cable is all digital, meaning any properly functioning cable will provide a perfect picture. There is absolutely no picture quality advantage of purchasing a cable that is rated higher than the HDMI "High Speed" standard of a 10.2 Gbps! There are added features available on some HDMI "High Speed" cables, including audio return and Ethernet pass-through. However no source devices sold today include the Ethernet feature and no HDTVs today include an audio return channel. There may be differences in the quality of materials, construction and wire gauge using premium-priced HDMI cables. These differences could be beneficial if you are constantly disconnecting and reconnecting the same cable. HDMI cables provide a complete signal transfer as long as the cable conforms to the HDMI specifications (if it is defective or improperly designed i.e. a bad HDMI cable will produce a high error rate which can cause signal dropouts, such as the screen going black then the image reappearing). To summarize, buying a more expensive HDMI "High Speed" cable — regardless of labeling or what a salesman tells you — will not give you any improvement in picture quality. Use the money you save from not falling victim to misleading HDMI packaging towards the purchase of products or services that will increase your enjoyment of HDTV, such as a Blu-ray player, professional set-up and calibration or a surround-sound audio system.